The Excelsior Log on display at the Scarborough Maritime Heritage Centre is a nautical instrument for measuring a vessel's speed and distance travelled. When navigating a ship it is essential to be able to estimate the boat's speed and distance travelled to determine its position at sea. In times past the only way to measure a ship's speed was to throw a wood log into the water and observe how fast it moved away from the ship. In the 16th century, the log was fastened to a rope knotted at set intervals. The log was thrown over the stern (back) of the vessel and a crew member counted the number of knots that were paid out in a set time. From this they could estimate the speed of the vessel through the water. This was known as streaming the log and is also the derivation of the knot as a measurement of nautical speed. In 1878, Thomas Ferdinand Walker (1837–1921), an engineer in Birmingham, patented a mechanical log in which a recording instrument was attached to a rail at the stern of a vessel connected by a long cord with a rotor which was towed behind the ship. The instrument dial recorded the distance travelled. The 'Log' at the Heritage Centre was recovered from a skip in Scarborough and was one of the first artefacts collected by the volunteer group. It is made of brass with a ceramic dial, with the main scale marked from 0 to 100 nautical miles and an inset dial marked from 0 to 10 miles. It has a fixing plate, on which it can turn, with which it would have been attached to the 'taffrail', the rail at the stern of a ship, usually on the starboard side. 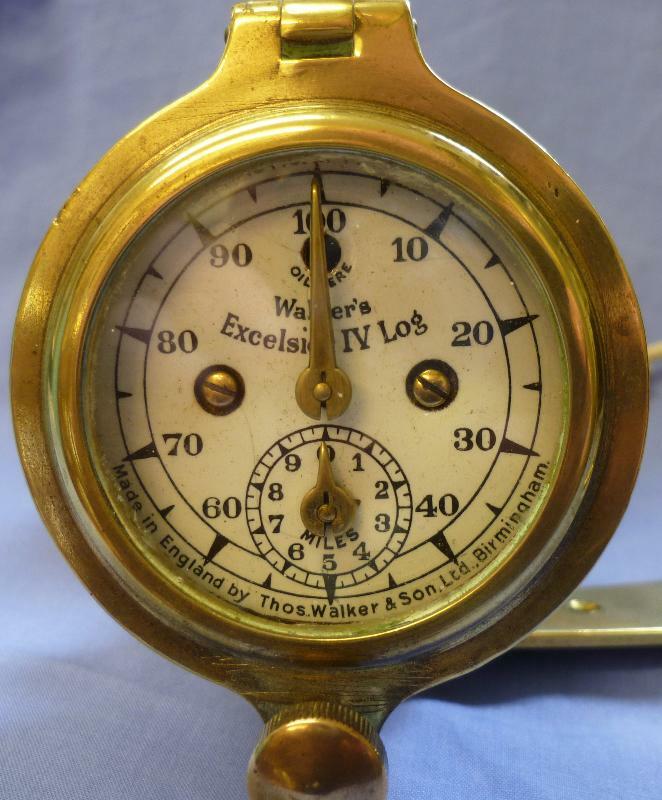 The Walker’s Excelsior Mark IV instrument was designed for smaller vessels, such as yachts, launches and fishing vessels. Its exact date of manufacture cannot be determined but this design was manufactured in the first half of the 20th century. These mechanical logs have now been superseded by electronic equipment such as GPS navigation instruments.